(Uncanny X-Men#325 (fb) - BTS) - Mikhail Rasputin transported the Morlocks to an alternate dimension, called the Hill. After the first generation of Morlocks lived in peace, the young grew up disenfranchised, angry, and full of rage that their elders had abandoned Earth so easily. (Uncanny X-Men#374 (fb)) - In the Hill dimension, time passed quickly as decades would flow by in a matter of Earth months. The children were kept in a stony citadel, where they grew. (Uncanny X-Men#374 (fb)) - Life for the Morlock youths was one of constant combat as they struggled and fought to make it to Mikhail's citadel at the top of the Hill. When young mutants manifested their powers, they were immediately required to enter the combat. Those that reached the top of the Hill were required to continue fighting for their place there, even when they became Mikhail's personal guards. (Uncanny X-Men#374 (fb)) - When Marrow finally reached the top of the Hill for the first time, a savage and brutal fighter, Mikhail ordered her to fight in order to stay. She fought and killed Mikhail's two guards. Mikhail agreed to let her stay as long as she was prepared to continue fighting. (Uncanny X-Men#325 (fb) - BTS) - They found a way to return to Earth so that they could get revenge on the humans. (Uncanny X-Men#322 (fb) - BTS) - Gene Nation attacked a disco, killing dozens of humans there in the name of mutants. (Generation X#5 (fb) - BTS) - Seeking to impress the Dark Beast, who they knew as the creator of the Morlocks, Marrow and Hemingway kidnapped the White Queen while she visited New York, and left her staff murdered and impaled to the wall in a bloody game of tic-tac-toe. They kept her powers subdued with the help of young Leech, and tied her up in the sewers. (Generation X#5) - Hemingway heard Frost's students Jubilee, Skin, and Synch coming up the elevator at her building and he punched it repeatedly, determined to kill them. They evaded his blows and knocked him backward with pyrotechnics until Hemingway punched the floor, knocking the students off their feet. Synch, tapping into Hemingway's powers, knocked him through the floor to the pavement below. (Generation X#6) - Marrow and Hemingway continued taunting Frost, who remained defiant, but they reminded her they were only keeping her alive until Dark Beast arrived. Marrow defended their murders as their right just before Frost knocked Leech out with a kick. Frost then fired off their cerebral synapses as her students arrived, then Dark Beast set off an explosion in the tunnels, allowing Marrow and Hemingway to escape. (Uncanny X-Men#323 (fb) - BTS) - Sack took over the body of forensic investigator Glenn Chen. The process is painful for the host, but always fatal. (Uncanny X-Men#323) - When Charlotte Jones brought Cannonball, Storm, and Wolverine to Chen to learn more about the bodies, "Chen" told them that 33 had died from mysterious circumstances. Wolverine smelled Sack on Chen, though, and sliced him open. Sack emerged, impressed that Wolverine had smelled him, the Vessel burst into the room as well. (Uncanny X-Men#324) - Jones tried placing Sack and Vessel under arrest, but Vessel stated that if the Morlocks couldn't keep them down, neither could the X-Men. Sack leapt at Jones, who shot him repeatedly, but the bullets passed through and he easily healed. Cannonball knocked Sack through the wall while Wolverine attacked Vessel, who stated that he could absorb remnant energy (psionic and physical residue) from the recently deceased and transmute it into physical power, as he batted Wolverine aside. Storm blew Vessel into a wall while Sack tried possessing Cannonball, who attempted to resist as best he could. Vessel attacked the nearby political rally of Graydon Creed, shaking off their gunfire and throwing a rock at Creed, who was narrowly saved by Beast, who Vessel mistook for Dark Beast. Vessel shook off attacks from Storm and Wolverine, though he started losing the remnant energy he'd drained. Before Sack could finish his possession, Cannonball took off and sent Sack flying. Storm hit Vessel with a mighty lightning blast that drained the rest of the remnant energy, sending all the souls sprawling out of him. One of them hit Sack, who disappeared. Vessel soon escaped as well. (Uncanny X-Men#325) - On the anniversary of the Mutant Massacre, Marrow led Gene Nation in capturing an entire subway full of humans. Callisto returned from the Hill to recruit the help of the X-Men, claiming that the former attacks had only been tests by Gene Nation on the X-Men. They used advanced technology to block themselves from the X-Men's Cerebro. Callisto soon led Colossus, Storm, and Wolverine into the Tunnels, where they found a human murdered with his bicycle and a message painted in blood to the X-Men. Reverb tracked the X-Men's thought-prints, revealing the roster to Marrow and Sack, shocked at Callisto being there. Marrow, uncaring, told Reverb to tell the others telepathically. Hemingway, who Callisto noted had mutated more (likely due to the Dark Beast) attacked and pounded Colossus into the sewer floor. Vessel punched Wolverine aside, more powerful than when the X-Men last fought him. Storm and Callisto found the subway humans running off and Sack, possessing one, shot Callisto before shedding his form and holding a gun to Storm's head. She hit him into the water with a powerful wind as Marrow revealed herself. Marrow blamed Storm for much of the Morlocks' plight and revealed that she had hostages wrapped in incendiaries. She claimed that the bomb would go off as long as her heart continued beating as they were attached. Marrow tossed bone knives to Storm and they started battling. Marrow was shocked when Storm drew first blood and licked the knife. Wolverine and Colossus, done with their battles, joined them as Storm kept stabbing Marrow, begging her to stop. Reverb tried telepathically stopping Storm, who hit Reverb with two thrown knives. With only 30 seconds left, Marrow continued taunting Storm, who ripped Marrow's heart out to stop the bomb. Callisto teleported back to the Hill with Hemingway, Vessel, and Sack, all in restraints. (Storm I#3) - The Morlocks of the Hill continued struggling to climb to the stop of the Hill as Mikhail encouraged them. When one ascended high enough, Mikhail kicked him back down and ordered the gates closed for the day. They tried pulling Storm off the top of the Hill, but she scattered them with lightning. Mikhail introduced her to those that were the strongest, and they named themselves Pain (Hemingway), Snow, Loss, Glass (Sack), and Charm. He told Storm that they were being sent to Virginia to destroy X-Factor headquarters. When Storm vowed to stop them, the attacked, slashing her back with a knife as Callisto rushed in. Mikhail involuntarily began opening a gateway to Earth as someone was performing the Ceremony of Light as Storm downed the Gene Nationals with a whirlwind. 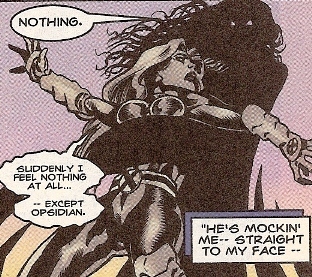 Callisto threatened to kill Mikhail as he'd killed Marilou (to fake Storm's corpse), but the Gene Nationals told Mikhail that if he did as Storm asked, they would detonate the bomb there. (Storm I#4) - Loss reminded Storm of the bomb as they waited for her decision. At Storm's prompting, Mikhail moved the entire Hill population to New York City, shocking the Gene Nationals. They landed in the old Tunnels, where Cable waited, and Storm ensured that Mikhail got every last mutant there. As Cable struggled to figure out what was going on, Loss reminded them of the bomb, still threatening to detonate. Storm kept Cable under control, though he punched Mikhail once the transport was complete, and Storm held Callisto off with lightning. Callisto departed, meeting up with Marrow, and Storm seemingly killed Mikhail, causing the Gene Nationals to respect her, not knowing Mikhail had only teleported away. As the X-Men (Cyclops, Gambit, Phoenix, Wolverine) arrived, Storm determined she would send the Gene Nationals to a struggling village in Africa, where they would have to work and strive to survive. She promised to keep a close eye on them. (Uncanny X-Men Annual 1997 (fb) - BTS) - Humanity's Last Stand, led by Commander Jared McGee and including Coral Trent and Sean, focused attacks on a settled village of Gene Nationals in Africa, mounting several Razor and artillery attacks. Their initial attack cut of the village's communications with the outside world. Coral Trent, a Lieutenant Commander, was among the attackers, mourning the loss of her sister Eve in the dance club massacre. (Uncanny X-Men Annual 1997) - The X-Men (Cannonball, Cyclops, Phoenix, Storm) arrived to defend the Gene Nationals from the Razors. When Cannonball was nearly overwhelmed, Boost extended his powers, allowing him to take down several Razors in one shot. Tether, with her electrified tail, rushed to check on Boost. When the Razors fled, Storm let them go. D'Gard checked in with Storm, questioning how she could have left them behind and how much more they had to endure. Tether, refusing to be calmed by Boost, angrily confronted Storm on her mistakes. That night, the Brotherhood (Dark Beast, Fatale, Havok) arrived to help the Gene Nationals as well, despite their conflicts with the X-Men. Boost convinced Tether to stay there and defend their people, though she was reluctant to do so. D'Gard wondered whether the philosophy of the X-Men or the Brotherhood was more correct. A massive battle broke out. D'Gard watched as Cannonball narrowly saved Fatale from one blast. D'Gard sensed the emotions of the survivors under a massive wreckage and grew impressed as she fought her claustrophobia to help rescue them. When McGee ordered Coral to open fire on the wounded, Cannonball, Boost, and Tether rushed to stop her. The insane bloody battle continued until Storm, her powers enhanced by Boost, managed to distract the Razors with a sandstorm while Dark Beast commandeered their armor, sending the Razors up into a massive lightning storm. The captured Razors were gathered together and Tether demanded their death. Havok was willing, but the X-men argued against it. As they fought about it, Dark Beast killed all the human pilots, overwhelming D'Gard with their sense of loss. D'Gard chose to keep the Gene Nationals in the village with no contact with the outside world. Boost and Tether departed with the Brotherhood, though they vowed not to joint he team. (Generation X#50) - Acting on Dark Beast's orders, Membrain disguised himself against the wall of the Massachusetts Academy, eavesdropping on students Jubilee, Synch, and Gaia complaining about all the new students at their school, and telepathically relaying the information back to his leader. Dark Beast ordered Membrain, Fever Pitch, Vessel, and Hemingway to attack. Membrain soon attacked M and Synch at a local tattoo parlor, emerging from the sewers and launching some of his psi-sensitive mucous membrane body at the teens, but they used their psi-training to block it. M punched Membrain across the street, but he covered her in more mucous. Both Synch and M continued trying to fight, but Membrain's powers had already weakened them and they both fell unconscious, disappointing him for their poor fighting prowess. Fever Pitch attacked Chamber and Skin in a boat, setting it on fire and sending a crowd running and screaming away. Chamber knocked Fever Pitch into the water, then he and Skin helped the nearby humans escape. Fever Pitch jumped from the water, knocked out Chamber, and convinced Skin to surrender, threatening to harm other humans if Skin didn't. Hemingway and Vessel attacked Jubilee, Husk, and Gaia aboard the monorail; Hemingway stopped the train while Vessel broke inside. Vessel shook off Jubilee's fireworks, threw Husk into the water, then, with his teammate, moved in on the other two. As Jubilee hit Vessel with a blast in the face, Gaia turned a train car into a giant arm and grabbed Hemingway with it. Hemingway broke free and knocked Gaia out while Vessel knocked out Jubilee. Husk, in a steel form, managed to defeat Vessel, then turned to fight Hemingway, who she managed to nearly defeat until Vessel awoke and defeated her. They took Husk and Jubilee, leaving Gaia behind, thinking she was dead. (X-Man#50) - With their captives being experimented on by Dark Beast, Gene Nation waited to follow his instructions. Membrain waited outside their fortified sewer base and telepathically relayed the arrival of White Queen, Gaia, and X-Man back to his leader. White Queen hit Membrain with a powerful psi-blast, scattering him through the tunnels. They blasted through the specially reinforced door, only to find the captives and the Dark Beast's army. 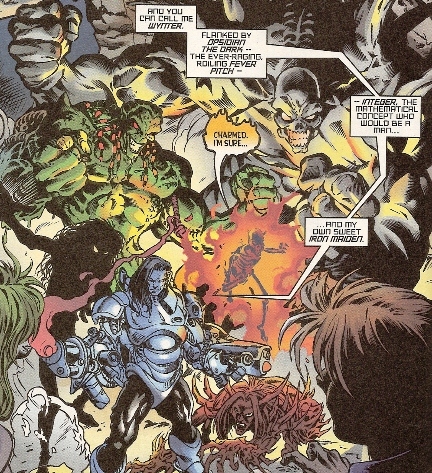 Dark Beast controlled a robot named Wynter and led Fever Pitch, Hemingway, Integer, Iron Maiden, Opsidian the Dark, and Vessel against the intruders. X-Man immediately held them back with a telekinetic wall, but the villains hit it with their combined powers and shattered it. 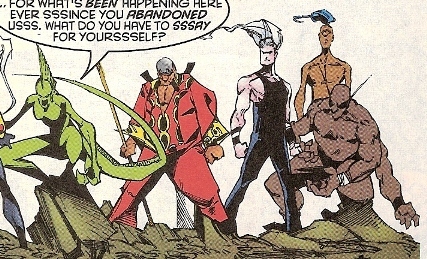 White Queen freed the students one at a time while X-Man, light bent around to turn himself invisible, defeated Vessel and punched Hemingway, who'd increased himself to giant size. Integer, who as a non-person was immune to X-Man's powers, distracted X-Man so Hemingway could grab him, but Jubilee hit Hemingway with fireworks and forced him to let X-Man go. The mutants combined their powers against Hemingway, who was knocked back by a mighty burst from X-Man. Fever Pitch hit Skin and M with a fiery blast, then another blast reflected off Husk. Iron Maiden lashed at Husk repeatedly, but M held her off and soon knocked her out. Opsidian then wrapped himself around M as Integer continued avoiding X-Man's telekinesis. Wynter grew furious as X-Man continued destroying the lab. Fever Pitch fired as Synch, who, mimicking Husk's powers, reflected it into Opsidian, knocking him out. When Synch tried mimicking Integer, however, he was overwhelmed and began speaking in binary code. 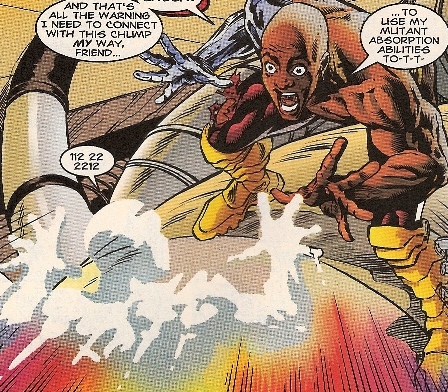 Fever Pitch hit X-Man with multiple blasts, but he used psi-armor to repel the energy attacks, knocking Pitch's non-burning skeleton to the ground. The heroes then surrounded Wynter, dismantling him. A hard light projection of Dark Beast laughed at the heroes before dissipating. (Spider-Man/Marrow#1) - When Marrow returned to the tunnels, Hemingway welcomed her back. 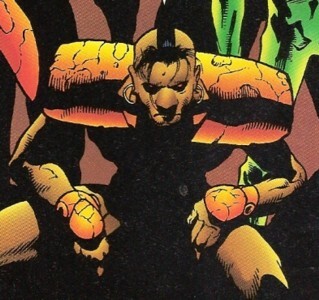 (Weapon X: The Draft - Marrow#1 (fb) - BTS) - D'Gard was apprehended by the US government and kept in seclusion. (Weapon X: The Draft - Marrow#1) - When Marrow snuck in to see D'Gard, he was shocked at how beautiful she looked. She stabbed him with a bone, killing him on assignment from Weapon X. (Weapon X II#19 (fb) - BTS) - Using the resources obtained from Cable, Marrow reorganized Gene Nation and initiated attacks on known Weapon X facilities. (Weapon X II#19) - Gene Nation bombed a Weapon X facility in New York, killing 32 people. They wondered what happened to Cable, about the name change, and about their intense new tactics, though they trusted Marrow to lead them. Marrow, meanwhile, struggled with the bones that started growing on her face again, fighting against her desire for beauty. Marrow was shocked when Maverick held her at gunpoint, but he was quickly restrained by Vessel and Hemmingway. Maverick quickly released himself, so Marrow convinced him that working with her was in his best interests. Maverick agreed to join Gene Nation as they had a common goal. (Weapon X II#20 (fb) - BTS) - Gene Nation continued their attacks on Weapon X in Las Vegas, St. Louis, and Washington D.C. Marrow assigned Maverick to lead an attack on Grand Central Station. (Weapon X II#20) - While Marrow watched the news, Agent Zero snuck in and slipped a wire around her neck, choking her. After mocking her, Zero got Marrow to admit the planned attack. She then grew bone claws and freed herself, but Zero proved her better, so Marrow reconfigured the bones in her nose and signaled her allies. Vessel and Hemingway burst through the wall with others and Zero chose to go after Maverick instead, promising to be back. (Weapon X II#21) - Marrow, Vessel, and Hemingway monitored reports of Zero's attacks on Gene Nationals everywhere, slaying all he came into contact with. Days later, he attacked Marrow's headquarters again, easily killing Vessel and Hemingway. He chose to leave Marrow alive so that she wouldn't be considered a martyr, but promised to come back for her after the rest of Gene Nation was gone. Comments: Created by Scott Lobdell, Bryan Hitch & Cam Smith. In the main image of this profile, Ever is featured in the center. 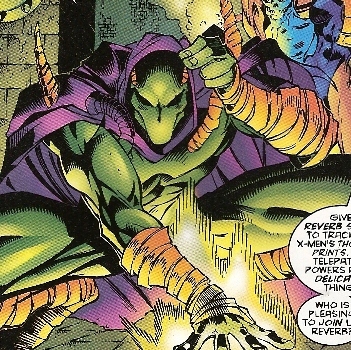 Ever is a mutant used by the Dark Beast and was part of Havok's Brotherhood, but he was never seen as part of Gene Nation. 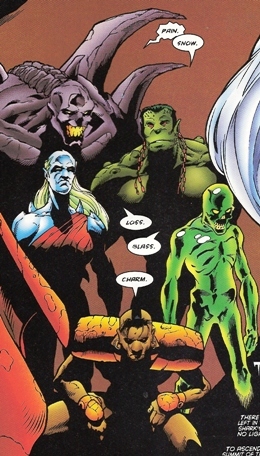 (Storm I#3) - Mikhail Rasputin used the strongest warriors as his protectors, Gene Nation, in the Hill dimension. Mikhail introduced the kidnapped Storm to his guards, and they named themselves Pain (Hemingway), Snow, Loss, Glass (Sack), and Charm. He told Storm that they were being sent to Virginia to destroy X-Factor headquarters. When Storm vowed to stop them, the attacked, slashing her back with a knife as Callisto rushed in. Mikhail involuntarily began opening a gateway to Earth as someone was performing the Ceremony of Light as Storm downed the Gene Nationals with a whirlwind. Callisto threatened to kill Mikhail as he'd killed Marilou (to fake Storm's corpse), but the Gene Nationals told Mikhail that if he did as Storm asked, they would detonate the bomb there. Charm's mutant abilities are unrevealed. It is unknown if he retained his powers after M-Day. (X-Man#50) - With their captives being experimented on by Dark Beast, Gene Nation waited to follow his instructions. Membrain waited outside their fortified sewer base and telepathically relayed the arrival of White Queen, Gaia, and X-Man back to his leader. White Queen hit Membrain with a powerful psi-blast, scattering him through the tunnels. They blasted through the specially reinforced door, only to find the captives and the Dark Beast's army. Dark Beast controlled a robot named Wynter and led Fever Pitch, Hemingway, Integer, Iron Maiden, Opsidian the Dark, and Vessel against the intruders. X-Man immediately held them back with a telekinetic wall, but the villains hit it with their combined powers and shattered it. White Queen freed the students one at a time while the others battled. Integer, who as a non-person was immune to X-Man's powers, distracted X-Man so Hemingway could grab him, but Jubilee hit Hemingway with fireworks and forced him to let X-Man go. When Synch tried mimicking Integer, however, he was overwhelmed and began speaking in binary code. Integer and the others were soon defeated. Integer's powers remain mostly unrevealed, as do his origins. Speaking only in binary code, Integer was described as a non-person who was immune to telepathy. When Synch tried latching on to Integer's powers, Synch was overwhelmed. Integer was composed of a mist-like form that could pass through solid substances. It is unknown if he retained his powers after M-Day. (X-Man#50) - With their captives being experimented on by Dark Beast, Gene Nation waited to follow his instructions. Membrain waited outside their fortified sewer base and telepathically relayed the arrival of White Queen, Gaia, and X-Man back to his leader. White Queen hit Membrain with a powerful psi-blast, scattering him through the tunnels. They blasted through the specially reinforced door, only to find the captives and the Dark Beast's army. Dark Beast controlled a robot named Wynter and led Fever Pitch, Hemingway, Integer, Iron Maiden, Opsidian the Dark, and Vessel against the intruders. X-Man immediately held them back with a telekinetic wall, but the villains hit it with their combined powers and shattered it. White Queen freed the students one at a time while the others battled. Iron Maiden lashed at Husk repeatedly, but M held her off and soon knocked her out. The others were soon defeated. Iron Maiden possessed metallic skin and a bestial nature. It is unknown if she retained her powers after M-Day. Loss' mutant abilities are unrevealed. It is unknown if she retained her powers after M-Day. (Generation X#50) - Acting on Dark Beast's orders, Membrain disguised himself against the wall of the Massachusetts Academy, eavesdropping on students Jubilee, Synch, and Gaia complaining about all the new students at their school, and telepathically relaying the information back to his leader. Dark Beast ordered Membrain, Fever Pitch, Vessel, and Hemingway to attack. Membrain soon attacked M and Synch at a local tattoo parlor, emerging from the sewers and launching some of his psi-sensitive mucous membrane body at the teens, but they used their psi-training to block it. M punched Membrain across the street, but he covered her in more mucous. Both Synch and M continued trying to fight, but Membrain's powers had already weakened them and they both fell unconscious, disappointing him for their poor fighting prowess. The other students were successfully captured as well. (X-Man#50) - With their captives being experimented on by Dark Beast, Gene Nation waited to follow his instructions. Membrain waited outside their fortified sewer base and telepathically relayed the arrival of White Queen, Gaia, and X-Man back to his leader. White Queen hit Membrain with a powerful psi-blast, scattering him through the tunnels. The Dark Beast and Gene Nation were soon defeated. Composed of a mucous-like membrane, Membrain could cover others in his substance, communicate with others telepathically, and adhere himself to walls. It is unknown if he retained his powers after M-Day. (X-Man#50) - With their captives being experimented on by Dark Beast, Gene Nation waited to follow his instructions. Membrain waited outside their fortified sewer base and telepathically relayed the arrival of White Queen, Gaia, and X-Man back to his leader. White Queen hit Membrain with a powerful psi-blast, scattering him through the tunnels. They blasted through the specially reinforced door, only to find the captives and the Dark Beast's army. Dark Beast controlled a robot named Wynter and led Fever Pitch, Hemingway, Integer, Iron Maiden, Opsidian the Dark, and Vessel against the intruders. X-Man immediately held them back with a telekinetic wall, but the villains hit it with their combined powers and shattered it. White Queen freed the students one at a time while the others fought. Opsidian wrapped himself around M , who soon escaped. Fever Pitch fired as Synch, who, mimicking Husk's powers, reflected it into Opsidian, knocking him out. The rest of Gene Nation was soon defeated. Opsidian could wrap his shadowy form around others. It is unknown if he retained his powers after M-Day. (Uncanny X-Men#325) - On the anniversary of the Mutant Massacre, Marrow led Gene Nation in capturing an entire subway full of humans. Callisto returned from the Hill to recruit the help of the X-Men, claiming that the former attacks had only been tests by Gene Nation on the X-Men. They used advanced technology to block themselves from the X-Men's Cerebro. Callisto soon led Colossus, Storm, and Wolverine into the Tunnels, where they found a human murdered with his bicycle and a message painted in blood to the X-Men. 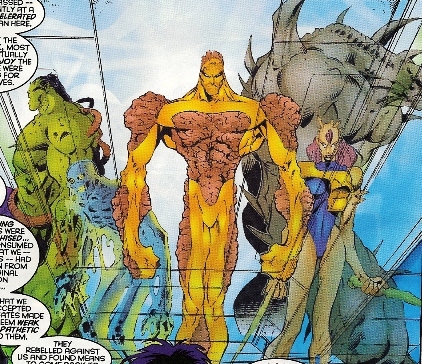 Reverb tracked the X-Men's thought-prints, revealing the roster to Marrow and Sack, shocked at Callisto being there. Marrow, uncaring, told Reverb to tell the others telepathically. Gene Nation was soon defeated, however. The green-hued Reverb could communicate telepathically. It is unknown if he retained his powers after M-Day.